The following submission is part of an ongoing Guest Post Writing Contest. Guest Post: Why I prep for surviving a disaster…. 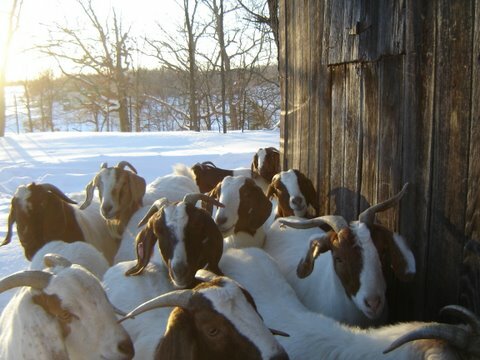 Great post on the Boer goats. I raised Saanan milk goats for 20 plus years. I really don’t think they were as fussy as the Boers must be. I just used a scissors to trim hooves, wormed twice a year, gave them oats and corn, same hay as the horses, and got them down within 3 months after freshening to milking once a day for the next 6 months. Two nannies can easily keep a small family in milk and cheese, just breed to have one kid early and one late. Mine ran with the horses and never got out 🙂 Dehorn or they are hard on the horses’ legs! Goats can also be driven as a single or in a team, packed, and pull small logs or other things. WONDERFUL pets! wanted some goats before but now REALLY want some! thanks for great information. An absolutely perfect article – full of wisdom – solid facts and good advice. THIS is the kind of prepping article that guides and provides all the information needed to make informed decisions. Excellent. Thank you! Wish I had enough property to have a goat….thanks for the great post.